* Every 32 minutes someone in the U.S. dies in an alcohol related accident. * Auto crashes are the leading cause of death for 6-27 year-olds. 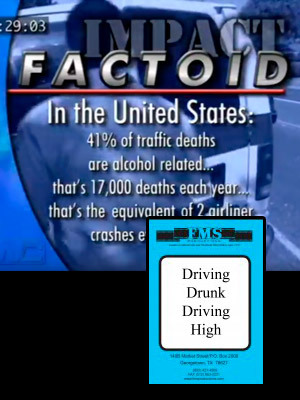 * Virtually all alcohol and drug related accidents are preventable. This hard-hitting video clearly illustrates the impact driving under the influence of alcohol or other drugs has on our society and on individuals. It stresses that the driver makes a choice, consequences follow, and the offender can’t go back and change what happened. The host, Steve Hanusa, brings more that 27 years experience to his interviews with families of victims, and representatives of the police, legal and criminal justice systems. The Spanish version is dubbed.